So many times the words "Midlife" and "Crisis" seem to be mentioned in the same sentence - and yet, from my experience, the two rarely go together. Midlife women today aren't falling apart at the seams, we aren't leaving our families and running off to an ashram to discover ourselves. We aren't sitting around weeping and wringing our hands over our empty nests. What I do see happening is a sense of it being our time to cast aside some of the personas we've worn over the years, and we're putting on something that is a better fit. 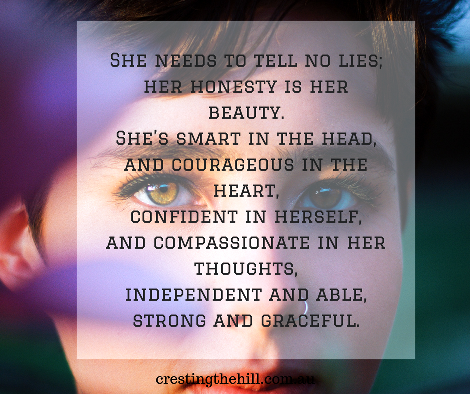 Finding who the "real" you is after 50+ years of being all things to all people can be quite challenging. What if we don't like that person? What if that person is really boring? Or what if that person wants to make some big changes? The unraveling can lay us bare and it can be quite scary. On the other hand, many of us discover that we actually really like ourselves without all the extra layers. We take ownership of who we really are and start working on becoming the best version of ourselves - our true self gets buffed and polished, and even celebrated a little. We stop fitting into spaces that are too tight for us now and we are willing to take up more space in our world. We've unpicked all the threads and kept the ones we like and we're tossing out the ones that don't suit us anymore. I think we're choosing the bright, colourful and robust and discarding the grey, dull and boring. We're choosing what can be re-worked into a better representation of ourselves. So, for me, there is a second stage to the unraveling process. 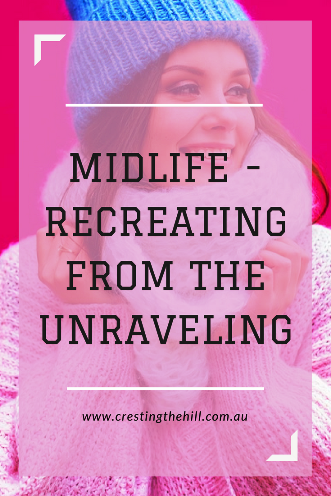 Midlife can be a time for gathering all the loose ends that the unraveling has produced, choosing which threads are worth holding onto, and we begin knitting ourselves a new life. It's like those women in days gone by who unraveled outgrown jumpers and took the wool and used it to create something new that fitted better and suited the wearer more. How lovely to think of ourselves unravelling what doesn't fit, and doesn't suit us - and re-knitting what's left (the bits we really like) into a life that's vibrant, and colourful, and eclectic, and completely, individually "us". I love the thought of Midlife women wearing their true colours and embracing the heart of themselves and letting that shine out. Are you peeling away the parts that you don't need anymore? Are you unraveling what doesn't fit and reworking it into a life that is completely "you"? Are you finding Midlife isn't about having a crisis and is more about gaining a whole new perspective? I've had two what I'd call a crises of sorts since turning 40 - one at 40 and the 2nd at 49/50. These major life events are what prompted the unravelling - although there have been other little knots ironed out as well over the years. In hindsight they needed to happen in order for that tipping point to be reached & growth into myself to occur. 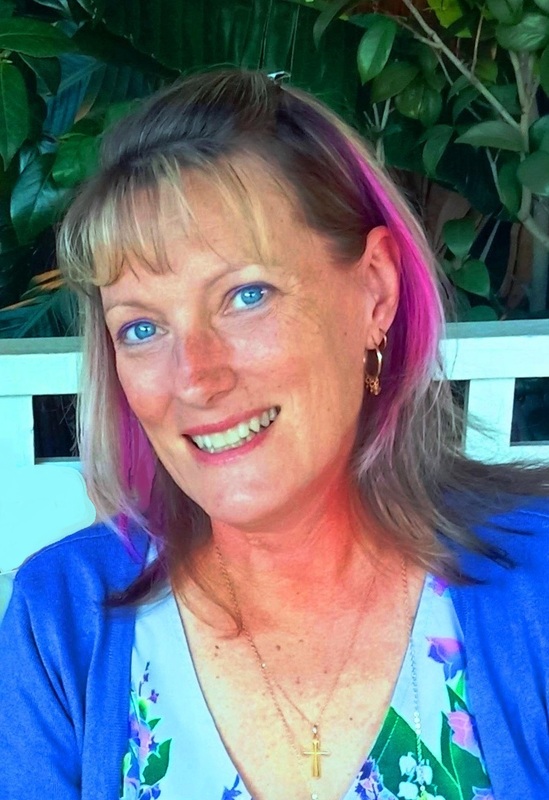 I ouldn't be writing, I wouldn't be in Queensland and I wouldn't be who I am if they didn't occur. I always struggle with changing decades Jo - I think subconsciously I realize I'm saying goodbye to one stage and launching into another. Still, I've never looked back with regret because each stage leads us to new adventures if we don't fight it - and look where it's led you! I think one of the advantages of (for lack of a better phrase) a troubled upbringing is that I started, in my 20s, to have the sort of positive selfishness (I can be me and help others and be a good person - one doesn't have to come above anything else) that usually only seems to come after 40! I think the next generation has this worked out better than mine did Vanessa (or maybe my childhood wasn't troubled enough?) It took until I was 50 to wake up to the fact that "positive selfishness" (love your term!) isn't a bad thing and it's something we all need - it's really self-care isn't it? I love that we can unravel the layers and discover even more about ourselves, Leanne. I have decided I will always be a WIP and enjoy learning to know who I am and trying new things. I'm very happy being almost 61 (next month) and life is certainly the best time now. I think being a WIP allows us to give perfectionism a miss Sue - if we never completely arrive then there's always new discoveries to be made aren't there? And you are the youngest almost-61 year old I know! Midlife is certainly an interesting time, isn't it Leanne? I like what you said about "women in days gone by who unraveled outgrown jumpers and took the wool and used it to create something new that fitted better and suited the wearer more" (not so long ago really, I remember doing this myself, but I know what you mean!) As a mum, for example, while I'm still needed it's not in the same way that I once was, and if I continue pursuing that there will be problems. As a daughter, my relationships with my parents have changed too. Some interesting thoughts in your post. I don't really give midlife much thought probably because I've never classified stages in my life. But I like the idea of discarding that which no longer fits or serves. I love that...Peeling back the layers. Sometimes that's exactly how it feels. You've already led a life that focused on your children and now it's time to peel back the layers and find out who else you can be. Exactly Jennifer! Those layers used to be a good fit, but we've outgrown them and it's time to peel them back and see what's waiting underneath. This struck such a cord with me, Leanne! So true! Thanks Diane - I always loved the unraveling concept - but what do we do when the unraveling is finished? Time to create something new! Oh Leanne I love your imagery with the jumper (sweater)! As many of my friends retire, by choice or circumstantial, this is a constant conversation, finding a niche or several niches. I have paired down my business involvement and adding fun in my craft hobby. Since I love sales, face to face, I was missing that from my online company,. I love to shop and sew so selling my crafts at bazaars and art shows fills my creative itch! I love that we get to keep re-inventing ourselves Haralee - if we sit and stagnate, or we're too scared to create a new normal then we miss out on so much. I really enjoy seeing your creative efforts pop up on my FB feed - they always make me smile. awesome post! thank you for sharing your perspective. Love the imagery used in this post Leanne. As for midlife crisis -- my life fell apart when I was 31 and then my fourth career fell apart when I was 51. These both led to my questioning who I wanted to be when I grow up. I've come to realize that with each reinvention I appreciate more and more who I become. I'm the same Janet - with each career shift, with my kids disappearing off to the city, with marriage upheavals and friends who weren't friends.... I think it's all of those things that help the unraveling to occur and for us to reknit ourselves into someone stronger and more vibrant. Turning 70 next year is putting me way past the midlife ...I sure do recall some of my decade memories but it really has only been since I was 65 that I (and my husband) have discovered what it is like to be us two. We married young, had our first child young and so it took us till now to find a life that's for us. Even my cancer hasn't affected that terribly. In fact it has probably brought us even closer as we navigate the ageing path ahead. It's interesting how the unraveling happens at different stages for each of us Denyse - mine feels like it hit at 50 but Janet's comment above yours sounds like she hit hers earlier and you reached yours later - as long as we use it to move forward and create a better life then it's been worth the upheaval and readjustments involved. I love the metaphor of unravelling and reknitting a garment (our life) that suits us better. I hope all my crises are behind me (for now, at least) so I can continue to knit that new outfit! Thanks Deb - I'm hoping mine are behind me too - there seem to have been more than my fair share! At the same time, they taught me a lot and I think the garment I'm creating is looking mighty fine these days! I have these thoughts whirling around inside Deb and I'm glad they resonate with you too. I don't think I've had one major crisis either - lots of mini ones along the way that have gradually unpicked my old outfit and now the one I've been knitting is really coming together and I'm liking it a lot. This is great, Leanne! I absolutely relate to the metaphoric unraveling and knitting back together of the loose ends. Still a work in process but I am letting the frayed ends fall off that are worry, unnecessary busy-ness and self-pressure just to name a few. Weaving it back together to have more calm, focus and clear vision for satisfying engagements. I recently discovered Brene' Brown and this is the very first thing I read from her, she really gets to the core of things. I really enjoyed your post and appreciate all of your support and advice. Thank you! I love Brene Brown too Lori Jo - she is so wise and calm and just "gets" Midlife without trying to turn it into something it's not. The thing with unraveling is that it's pointless if it doesn't lead to us creating something more beautiful out of what's left - I like the idea that we're becoming our best selves - how great is that?! So far no crisis for me, Leanne. I enjoy my new discoveries. Thanks for sharing your views and metaphor. I don't think we need a crisis to unravel the old and turn it into the new Natalie - some people do it gradually over time (others in one big bang!) I like a quiet undoing of the old and re-doing of the new myself. Unravelling. That's a great word. I haven't unravelled yet ... but my husband started to when he hit 50. All good again now though. I think we look back and see our unraveling is different for all of us Leanne - some have a major one like your husband, others do it gradually by shedding layers and finding a new normal. I think I did a combination of the two! So well said, Leanne. I love the idea of unraveling the old life and knitting it into something new--not necessarily discarding who we were, but reworking it into another form that better suits us. And I agree with you; I am definitely not in crisis. I am evolving, and I am doing it intentionally, not in a panic like a crisis suggests. Your writing spoke to me, as it so often does. Thanks so much Christie - and you grasped what I was trying to say perfectly! It's not about tossing the old garment in the bin and looking for something shiny and new, it's about taking that jumper that doesn't fit and is a bit tight in places and letting it out, adding to it, taking bits away - and turning it into something beautiful that can grow old with us. I want to create something that is lasting and fits Midlife (and maybe Oldlife) me perfectly. I had read Brene's take on the unraveling and agree with you both. We have been so many things to so many people all of our lives and now we can be who ever we want to be. The older I have gotten the more me I am I am in caregiver mode right now but who knows what the future holds. I'm so glad you liked it Trisha - it's a thought that I've had swimming around in my head for a while and it was nice to put it down and form it into something tangible. I love the idea of unraveling all the bits of ourselves we don't need any more, but if we don't take what's been experienced and re-form it into something new then we've wasted all those years - and that would be such a shame. A very good topic to write about and discuss. 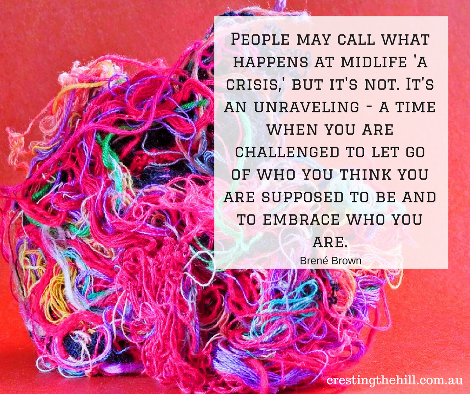 Midlife is not a crisis. Some just see it as a crisis. If one looks at midlife from a different angle, it is no longer seen as a crisis. For me personally, there are many tasks that are left unfinished, but nothing very important. So as I go along, I shall find time to attend to them. The concept of unravelling is quite interesting. I haven't had to unravel anything very significantly, or reknit to suit myself better. At least, not until now. The roles in career are still on, since I have a few more years to officially retire. Once that happens, there will be some changes, since I won't be required to confirm to many official routines and commitments. Shedding my official career roles could be seen as one form unravelling, probably. Some roles as a father have ended as my son has grown up and is on his own. That has given me more time and mindspace to pursue some passions that are close to my heart. I think unraveling happens to us all in different ways Pradeep - maybe parenting is different from the father/mother perspective and the same with careers. I think we invest a lot of ourselves in different areas at different life stages. As we change stages and change what we invest our time in, we shed those layers and replace them with something new that's a better fit. That to me is the unraveling and the re-creating. I'm sure you'll see it more as your career winds down and you start focusing in new directions. Hi Jan - I think Midlife is going to last to 80 for me (I'll have to live to a very old age!) so 64 is still well within the range! 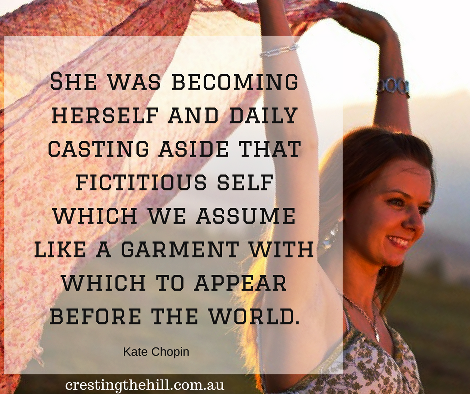 And I think unraveling and re-creating should be an ongoing process, adding little bits of interest to the garment of our lives and snipping away the old worn out bit is part of refining ourselves and becoming our best "self" - what's not to love about that? I'm past midlife but my refashioning started when I retired a couple of years ago. Before that, I think I was so caught up in workplace stresses and drama. I don't think I was very kind to myself during those years. When I retired, it seemed like a good time to re-evaluate what was important to me. I'm still working on it! It's a process and it's worth going through. I think leaving a career plays a huge part in unraveling that aspect of ourselves and re-knitting it into a creative and productive retirement. If we try to hold on to the old parts and don't start reshaping them, we end up with a life that isn't satisfying and doesn't look good on us - and nobody wants that! Wonderful metaphor! Unraveling and re-knitting. Made me think also of old-fashioned quilts where they used bits and pieces of old clothing (we have a few from hubby's grandma). I had a quilt made of my husbands old T-shirts - ones with great designs that he was never going to wear them again (too small)... repurposed and memory filled. Okay, that was just an aside... the thing that really struck me in your post was "what if the new me is really boring?" I think I worry about that... if people (hubby) will like (still love) the new me that is emerging. Thought provoking post for sure! I wonder all sorts of things about who I'm becoming as I lose/unravel/peel away the old roles that used to define me Pat. It's hard to get the balance right between being okay with the new me - even if I'm not as exciting or adventurous as I'd like to be - I guess the "real" me is what counts - and hopefully my friends and family will still love who I'm becoming! Leanne, your posts are so thought-provoking! As I move into retirement, I seem to be finding my true self as I allow myself to stop being so "corporate" and allow my goofy personality to shine through. And I'm having a blast - making YouTube videos and sharing them with others hopefully find them amusing! Thanks for the lovely compliment about my quotes Karen - I just love the words so much that I had to do them justice with a great picture. I also think that the unraveling might be a constant process where we keep discarding the parts we don't need and keeping the good bits, adding in new bits - it's a continuum, which is quite scary and exciting at the same time isn't it? Hmmm... I love this imagery of unraveling and then reinventing ourselves with the pieces of yarn we desire to keep (and discarding the rest). In fact, I think I might get out my knitting needles and start a small project - just to experience the tangible feeling of unraveling a creation in order to begin again. LOVE this ... and I will pin to my board for future reference. Thanks Janet - it was just something sitting on my heart that I wanted to share. I love the concept of unraveling that Brene talks about, but why unravel if we don't bring forth something new? So I'm all about the re-creation process too. I really do hope you start a knitting project - and post about it! I must confess I had a bit of a (hormonal) melt-down the other night as I envisioned both Sophia and the beautiful little girl in my womb growing up and leaving me. Their cheeks one day will no longer be chubby, they won't be small enough to pick up, they won't giggle in that beautiful, child-like way and they won't run to me crying "Mum-mum! Mum-mum!" when they fall over and scrape their knees. I could all of a sudden see the next 20 years of my life passing by in a flash and I wondered where I would be, who I would be, at the end of it all. In my pregnant, hormonal state it was all very upsetting! But I think that change is inevitable in life, and particularly at midlife there is this major change where the nest empties and the roles we have assumed for so long take on different meaning. It's not that we are no longer "mother", but that that looks differently now than it did when our children were young and needed us all the time. As one of my midlife friends put it, now they need you to go and check out something from Gumtree for them rather than change their nappies or help them with homework! We need to "unravel" or "unpick" the bits of our roles that don't work anymore and recreate them, accepting that what worked before may not necessarily work now. I think it takes maturity to be able to do this and I hope that when the time comes, I am able to make the best of midlife changes rather than weeping about them like I did the other night! You definitely have to hurry up and have that baby - she'll keep you so busy and so tired that you won't have a spare moment to worry about what things will be like in 20 years time. 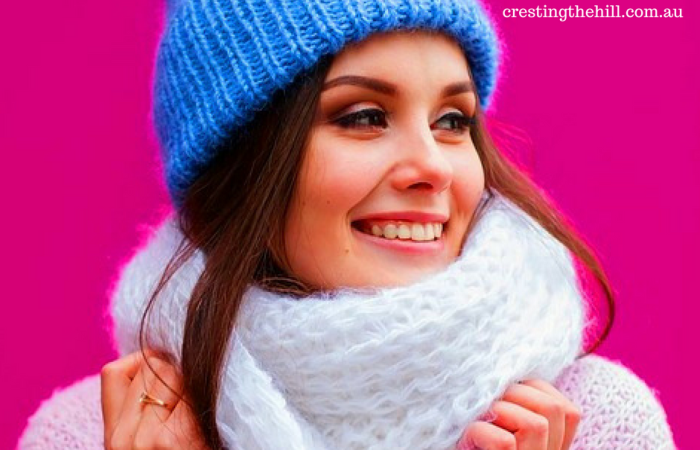 From my experience, kids hit the teenage stage and gradually become more independent and less pleasant to have around - by the time they are in their late teens you're quite happy to give them some space and let them find their life path. An unraveling...I really like this. It describes what it is like much better then a crisis. Crisis seems like something that happens for a specific time and then things go back to the way they were. The unraveling and the reknitting is much more descriptive of what I am going through as I am redefining myself and figuring out what does it mean to be a woman over 50. I am unraveling that old out of date 1980's "mom" sweater and creating a new soft cashmere beauty that is comfortable and timeless. I love that your old "mom" sweater is being reinvented into something beautiful Evelyn - why go through all that unraveling and undoing if you don't make something even better our of what remains? I'm doing my best to re-create something that fits me for the next decade or so too! I do like your analogy, Leanne. I determined long ago when my kids were young to enjoy every stage and let them grow and eventually fly. Despite some 'hiccups' along the way and some regrets, I have enjoyed each stage since. Each stage has its challenges and by grace we grow and re-knit into a better person. Love this image of midlife! Seems to be holding true for me! Thanks for sharing at The Blogger's Pit Stop!